Submitted by Randy: This has forty five stars which corresponds with 1896 (120 Celebration) and number of states. It looks like it is printed on a very fine cloth. It does have water stains and age spots. Someone put it in a blue frame. It looks authentic but I am not an expert. Please tell me what you think. I could not find a similar one on the internet Thanks. If you can help Randy please click on the comments button. 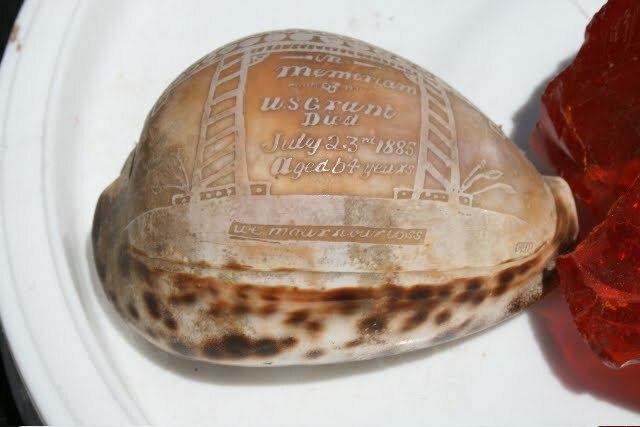 Submitted by Ron: Hello I have a hand engraved sea shell which says In Memorian of U S Grant Died July 23rd 1885 Aged 64 Years. I found this in florida in the late fifties, not sure where. Ive searched every where but cant find anything on it. Ive carried it with me all over the united states and now have tine to spend on this. Im not getting any younger so if you could give me any help on this would be great. Its in perfect shape so im begging to think its a one of a kind item. If you can help Ron with an appraisal, please click on the comment button. Thanks!